Somewhere between 20% – 40% of the water used for hydrofracking a well returns to the surface as wastewater, also known as produced water. This wastewater not only contains the toxic and hazardous chemicals used in fracking fluid but also contains contaminants that it picks up from deep within the earth, most notably heavy metals, volatile organic compounds, salty brine and radioactive materials. Theoretically, this toxic cocktail could be treated at treatment facilities assuming these plants were properly equipped to remove these chemicals and radioactivity, however, there are few if any plants in New York State that currently have the technology to do this. Insufficient or incomplete treatment of wastewater will result in water being released into our streams, rivers and lakes that contain contaminants that are in higher levels that are considered safe. This is in fact what is happening in neighboring Pennsylvania, presenting significant health risks. Naturally occurring radioactive materials, known by the acronym NORM, are common in gas drilling waste. Radium, a potent carcinogen, is among the most dangerous of these metals because it gives off radon gas and takes 1,600 years to decay. In an article first published in ProPublica and then in the Albany Times Union on November 9, 2009, Abrahm Lustgarten reported that the New York Department of Environmental Conservation analyzed 13 samples of wastewater brought up thousands of feet to the surface from drilling and found that they contained levels of radium-226, a derivative of uranium, as high as 267 times the limit safe for discharge into the environment and thousands of times the limit safe for people to drink. In early 2011, the New York Times ran a 3 part investigative series on their multi-month investigation of radiation in wastewater. They reviewed thousands of internal documents from the Environmental Protection Agency (EPA) that revealed that fracking wastewater contains radioactivity and other toxic materials at levels that are frequently geometrically higher than the level that federal regulators say is safe for wastewater treatment plants to handle. EPA and industry researchers say that the biggest danger of radioactive wastewater is its potential to contaminate drinking water and enter the food chain through fish or farming. Many federal studies show that once radium enters a person’s body, by eating, drinking or breathing, it can cause cancer, asthma and a plethora of other health problems. For more on the health impacts of fracking, click here. The Times also found never-reported studies by the EPA and a confidential study by the drilling industry that all concluded that radioactivity in drilling waste cannot be fully diluted in rivers and other waterways. More than 1.3 billion gallons of wastewater was produced by Pennsylvania wells from 2008 to 2010, far more than has been previously disclosed. Most of this water — enough to cover Manhattan in three inches — was sent to treatment plants not equipped to remove many of the toxic and hazardous materials in drilling waste. Treatment plants in Pennsylvania discharged waste into some of the state’s major river basins including the Monongahela River, which provides drinking water to more than 800,000 people including Pittsburgh and the Susquehanna River, which feeds into Chesapeake Bay and provides drinking water to more than 6 million people. Drillers in Pennsylvania trucked at least half of their waste to at least 12 sewage treatment plants in three other states including two plants in New York that discharge into Southern Cayuga Lake near Ithaca and Owasco Outlet, near Auburn. Of more than 179 wells producing wastewater with high levels of radiation, at least 116 reported levels of radium or other radioactive materials 100 times as high as the levels set by federal drinking-water standards. At least 15 wells produced wastewater carrying more than 1,000 times the amount of radioactive elements considered acceptable. Most wastewater facilities cannot remove enough of the radioactive material to meet federal drinking-water standards before discharging the wastewater into rivers, sometimes just miles upstream from drinking–water intake plants. Federal and state regulators have given nearly all drinking-water intake facilities in Pennsylvania permission to only test for radioactivity once every six or nine years and with the blessing of regulators, have not tested for radioactivity since before 2006, even though the drilling boom began in 2008. Wastewater contains salty brine that is brought up from the earth. The saltiness of the brine creates high levels of total dissolved solids (TDS), which are compounds in the water that cannot be removed by a traditional filter. If these total dissolved solids (TDS) are not completely processed by a treatment facility, the water that is released by the facility into rivers and streams and then used for drinking water can create environmental pollutants known as Trihalomethanes (THMs) when the water high in TDS reacts with chlorine. THMs are considered by many to be carcinogenic. Wastewater treatment plants like the one in Endicott, NY cannot treat salty wastewater because they use a biological treatment process where freshwater microbes clean the water. High levels of salt and total dissolved solids (TDS) could harm the process. In July 2011, The Ithaca Journal reported that several municipalities in New York have approved the use of wastewater from drilling for use in winter snow and ice clearing and dust management. The DEC approved permit conditions include provisions that the road spreading be done in a manner that minimizes the chances of the brine running off into streams, creeks, lakes and other bodies of water. However, it is extremely unlikely that this toxic brine will NOT flow into the water in these areas. This means that the DEC will have sanctioned exposure to contaminated wastewater without having done any serious health or environmental assessment. Historically the industry has used open pits to store fracking water prior to transport to treatment facilities. The New York Department of Environmental Conservation (DEC) has justified not banning this practice in the Draft Supplemental Generic Environmental Impact Statement (dSGEIS), the permit conditions under which they propose to allow horizontal gas drilling using hydrofracking in New York State, released in September 2011, because they say that the gas industry has asserted that they are unlikely to use open pits for the storage of wastewater. Instead they have proposed a system where a lone DEC employee could grant approval without doing an individual environmental impact study. Open pits create a tremendous hazard, from the threat of being flooded and leakage to a pathway for human and animal exposure to chemicals through volatilization of chemicals sitting in the pits. For example, benzene and other volatile (light) hydrocarbons that are dissolved in liquids will enter the air when the liquid is exposed to the atmosphere. A May 2012 study by the Natural Resources Defense Council, In Fracking’s Wake – New Rules are Needed to Protect Our Health and Environment from Contaminated Wastewater showed that while fracking generates massive amounts of polluted wastewater that threaten the health of our drinking water supplies, rivers, streams, and groundwater, federal and state regulations have not kept up with the dramatic growth in the practice and must be significantly strengthened to reduce the risks of fracking throughout the Marcellus region and elsewhere. Across the United States, industries have disposed of toxic waste by injecting it into the earth. Until recently, scientists and environmental officials have assumed that deep layers of rock beneath the earth would safely entomb the waste for millennia but as Abrahm Lustgarten reported in ProPublica on June 21, 2012, there are growing signs that they were mistaken. Records from disparate corners of the United States show that wells drilled to bury this waste deep beneath the ground have repeatedly leaked, sending dangerous chemicals and waste gurgling to the surface or, on occasion, seeping into shallow aquifers that store a significant portion of the nation’s drinking water. 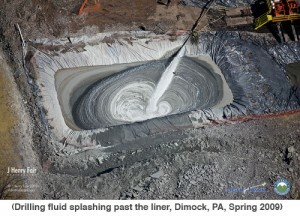 A May 2012 study by Environmental Advocates of New York, “Out of Sight, Out of Mind, New York’s Failure to Track or Treat Fracking Waste Endangers Public Health & the Environment” found that there is no clear record of how waste was handled from 6628 active gas wells that were fracked in New York State as of 2009. They discovered that existing state laws and regulations do not require oil and gas companies to report with any specificity how much waste is being created, its chemical components, or how drilling waste is being disposed. They uncovered that much of fracking’s waste would likely be classified as hazardous waste if it were not exempt under flawed state regulations. This is yet another example of the failure of government to protect us from the dangers of gas drilling.